Dracopis amplexicaulis (Vahl ) Cass. Stems: Erect, branched, grooved, glabrous; branches ascending. Leaves: Alternate, simple, clasping, elliptic-oblong to ovate, to 4 inches long, 1.5 inches wide, glabrous, waxy; margins entire or slightly toothed; tips pointed. Inflorescences: Heads, solitary to few, terminal, about 2 inches wide; bracts in 1 series, lance-linear, green. Flowers: Ray florets 5-10, .5 to 1.25 inch long, yellowish orange, spreading or drooping, sterile; disk florets fertile, in ovoid-shaped receptacle .5 to 1 inch tall, corollas purplish brown. Fruits: Achenes, cylindric to club-shaped, glabrous, several-nerved, without bristles or scales, enclosing small seed. 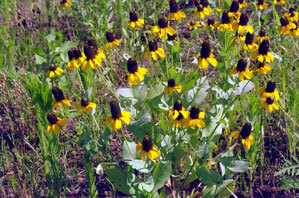 Habitat: Open, moist, disturbed sites, most abundant in clay soils. Distribution: Southeast 1/4 of Kansas.